An account of the powerful workers' movement in Scotland and the strike of 100,000 for a 40-hour week in 1919 which was savagely attacked by the government on what became known as Bloody Friday. Although unemployment decreased slightly in the few years immediately preceding the beginning of hostilities, inflation rose dramatically, increasing the prices of foodstuffs, rents and fuel, but decreasing workers’ wages by 15%. While conditions at work were fairly miserable, workers had to return to bad housing where overcrowding was not uncommon and disease rampant. The growing militancy that resulted from these conditions was soon swept aside in 1914 by a fever pitch of nationalist euphoria. The Clyde Valley, as a major source of supplies for the war effort, was soon to become a hive of militancy that would threaten the cosy, and mutually rewarding, relationship that had developed between the government and the unions. 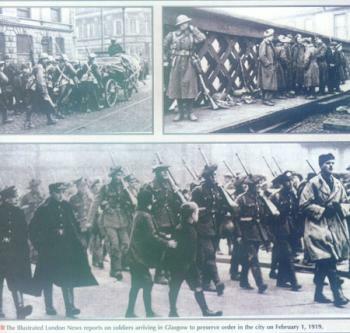 In February 1915, 10,000 engineering workers in Glasgow wildcatted demanding higher wages. Gaining no support from their own union, the Amalgamated Society of Engineers (ASE) which demanded that they return to work, the strikers decided to set up a Labour Withholding Committee (LWC) to represent themselves and organise the strike. Their demands ultimately failed to budge the bosses, but the LWC was widely seen as an important preliminary step to the formation of the later Clyde Workers Committee (CWC) of rank-and-file trade unionists and the shop stewards movement. The government reacted swiftly to the dangers posed by the strike. Union ‘leaders’ were quickly called to a special conference at which were signed the so-called ‘treasury agreements’ by which all independent union rights, including the right to strike, were suspended for the duration of the war. Labour was ‘diluted’ (by permitting unskilled workers to do skilled work) in order to deal with the labour shortage and the demands for munitions. The ‘Munitions Act’ made striking a criminal offence (! ), effectively illustrating the political-economic nexus that safeguards capitalism when it senses even the most incipient threat. The act set up tribunals to punish those individuals caught organising in the workplace, and in October 1915, sentenced 3 shipwrights at Fairfield Yard, Govan, to a months’ imprisonment for refusing to pay a fine in support of 2 sacked workers. The LWC reacted strongly by demanding the release of the 3 men and threatened widespread industrial action. Soon afterwards, the men’s fines were paid, and it was suspected in most quarters that the union bosses (seemingly fearing industrial action more than the employers!) had used union money to get themselves out of actually doing anything. “We will support the officials just so long as they represent the workers, but we will act independently immediately they misrepresent them". though its effects were clearly seen in the huge strike of 200,000 workers in Coventry, Barrow and Sheffield against dilution in March 1917. Following the end of the war, there were fears that unemployment, following demobilisation, would reach epic proportions. Shipbuilders, miners and engineers in a reformed CWC saw the only means to lessen the effects of full-scale unemployment was to work less. In January 1919, the 40 hour (the unions wanted 47 hours, a reduction of a mere 7 from war-time levels!) movement was set up to reduce the working week. On January 27th, 40 000 workers struck while mass pickets everywhere shut down factories that were still operating. By the end of the month over 100,000 were on strike. The government panicked. The secretary of state for Scotland, Robert Munro, said in a cabinet meeting that ‘it was a misnomer to call the situation in Glasgow a strike –it was a Bolshevist rising.’ At the same time in Belfast, 40,000 engineers were on strike and strikes in other industries were looming. "Trade union organisation was the only thing between us and anarchy—without it our position was hopeless." Aldred’s criticisms were valid ones. Where the committees failed was in channelling their strength into an all-out assault on all aspects of the struggle against capitalism, including the political struggle. Without moving beyond merely economic demands, the CWC found themselves in no position to combat the heavy-handed response of the boss class supported by government. Yet the committees never went beyond the confines of the existing unions and this was enough to explain their lack of real revolutionary credential. During the war, they placed all the emphasis on the economic here and now, and after the war, when the economy had collapsed, were easily picked off by a vengeful boss class. The short term benefits accrued were always going to be taken back by the bosses faced with the prospect of demobilisation and an increased workforce. Unemployment followed lock-outs as the movement was gradually snuffed out. By focusing also on the political and social aspects of struggle the committees could have made a difference, but the inherent nature of trade unionism itself militated against this, conditioning workers to lower aspirations and less confident methods of self-organisation. By moving away from a rank-and-filism that was head-banging a rather thick wall, and in doing so, shedding completely all ties with union bureaucracy, the committees, as nascent councils, could have gained support beyond the workplace and increased their support in the community at large. The council movement did not end in Scotland, however. In Russia, in 1917, councils or ‘soviets’ for a while continued the dream of working class self-organisation, and they have re-appeared constantly in revolutionary movements and uprisings ever since.